First of all we have the Sun Care Spray Gentle Milk-Lotion UVB20 (£18.00 at John Lewis) – this is basically sun protection made easy – which is what I’m all about! This is a no-fuss, no-mess milk lotion spray, with a fresh, fluid texture. It’s also water-resistant and ideal for all skin types in strong sunshine. 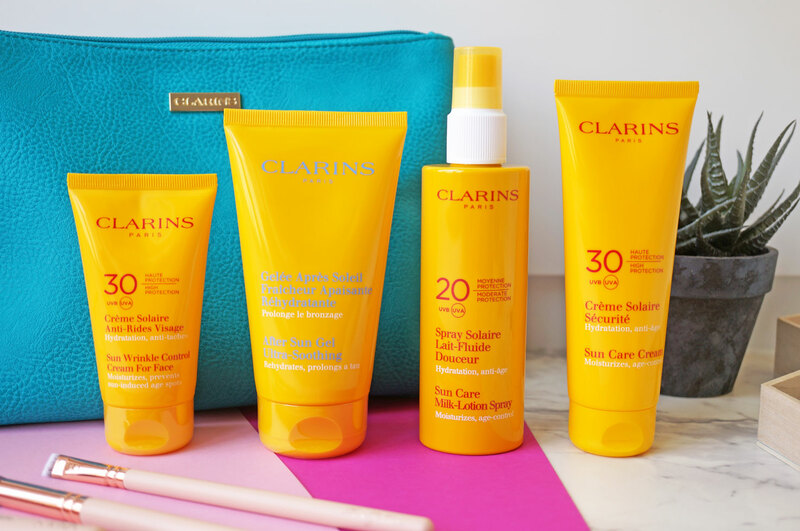 And next the Clarins Sun Care Cream For Sun-Sensitive Skin UVB30 (£18.00 at John Lewis) – as you can tell by the name, this product is specifically made for sensitive skin. It’s a surprisingly light-textured, water-resistant high-protection cream that’s specially formulated for fair and sun-sensitive skins in very strong sunlight. The Sun Wrinkle Control Cream UVB30 (£20.00 at John Lewis) – is described as ideal protection for sun-sensitive skin or skin exposed to intense sunlight. It provides reinforced sun protection with photostable and heat-resistant UVB-UVA filters, and it promises to protect against dehydration as well as helping to prevent the visible signs of premature skin ageing. And lastly the After Sun Gel Ultra-Soothing (£20.00 at John Lewis) – After sun is one of those products I never seem to have in the cupboard, until I actually need it and it’s too late! This ultra-soothing gel rehydrates the skin whilst prolonging your tan. It’s highly refreshing thanks to watermelon extract, and leaves skiing feeling moisturized, soft and supple. Top tip – keep your after sun in the fridge so it’s extra cool and refreshing on application.